With five games left in the regular season, it’s going to come down the wire once again for the Boston Bruins. Currently, the Bruins hold the final wild card spot, with a three-point cushion on between them and Tampa Bay. Tampa does, however, have one game in hand. It’s also beginning to look as though Carolina is attempting a late season sprint for the playoffs, as they have gone 7-0-3 in their last 10 games. This ties a franchise record 13 game point streak and has also vaulted them into playoff contention in the quickly closing playoff window. The Bruins are also only one point back of Toronto for third in the division. However, the Leafs do still have a game in hand. It’s also not out of the realm of possibility that the Senators could slip from their second place spot in the division to third, or even to the wild card spot the Bruins currently hold. Ottawa has gone 3-4-3 in their last 10 games, and they have not looked sharp. They also had to play their first game without Erik Karlsson in the lineup since the 2013 season, ending 342 consecutive games played streak from the Ottawa Captain and perennial Norris Trophy Candidate. If the Bruins manage to win the last matchup between the two teams on April 6th, that scenario is even more likely. The remaining schedule for the Black and Gold features games that are going to be tough contests, but if the Bruins continue to play the way they have these last few games, there is no reason to believe that the Bruins will be golfing in April instead of playing hockey. And while there is still a chance the Bruins miss the playoffs, I’ll go out on a limb here and say I don’t think that is happening this year. 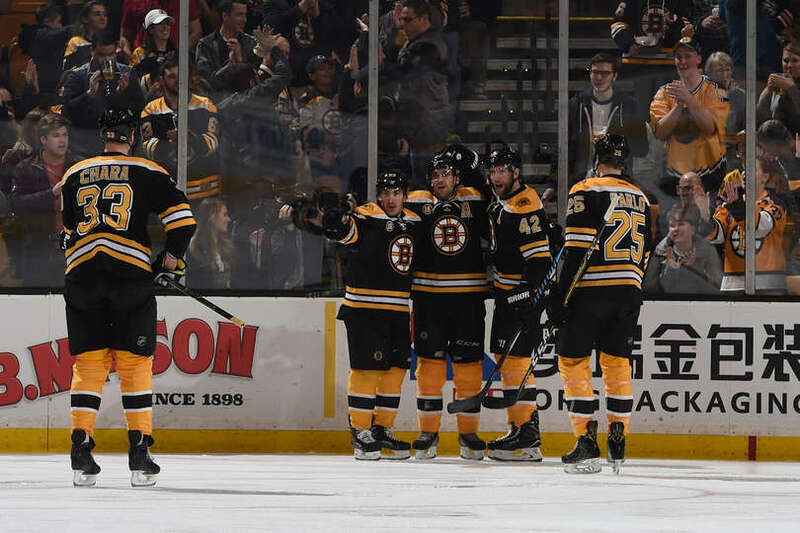 The Bruins next matchup is Saturday against the Florida Panthers, a team that the Bruins have not lost to this season, and have outscored 13-5 in the season series. Bruce Cassidy also confirmed today after practice that Tuukka Rask will be in net Saturday against the Panthers. Cassidy said that Tuukka Rask will start tomorrow vs. Florida. Assuming the Bruins take care of business Saturday they will have four games left, Chicago on Sunday, Tampa Bay on Tuesday, Ottawa on Thursday, and Washington on Saturday to close out the season. The only games in there that are not easily winnable are the Chicago and Washington games. But even the Washington game could be winnable for the Bruins as the Caps are likely to be resting their starters in preparation for the playoffs. Unfortunately, the Bruins do have to play Chicago on the second leg of back to back, with the Hawks fighting for the President’s trophy. Keep in mind this is not a bad route to the playoffs by any means. This remaining schedule is exactly the reason I stated I believe the Bruins will be back in the playoffs after a two-year drought. For comparison, Tampa Bay has two sets of back to back games, two games against the division-leading Canadiens, with one of those matches being in the second half of back to back. Not to mention the first half being up against the Maple Leafs who are also fighting for a playoff position. This is an incredibly grueling schedule to go through, especially at this point in the season, and I find it difficult to see Tampa Bay winning too many more of these games. Celebrate your Boston Bruins fandom with this Edge authentic hockey jersey from Reebok. This jersey features a combination of stitched-embroidery and twill applique Boston Bruins graphics. X-trafil fabric is included to provide additional reinforcement in the neck and shoulder areas. You’ll look just like your favorite Boston Bruins players when you rock this jersey! Carolina has it a little easier than Tampa Bay, though they still have two sets of back to back games as well as six games in nine days. These games include Pittsburgh on one back to back and Philadelphia on the other, as well as an away matchup against the Minnesota Wild. Possibly the toughest schedule remaining for any playoff fringe team is had by the Toronto Maple Leafs, though. Toronto also has six games in nine days, including Washington on the second leg of back to back, Tampa Bay, and back to back with Pittsburgh and Columbus. Ouch. That is a tough stretch for a young Maple Leafs team and could possibly be too much to handle. Finally, we have Ottawa. Their schedule is not as bad as Toronto’s, but given the way Ottawa has been playing lately, it could also spell trouble. Ottawa has a home and home against a Detroit team simply playing for pride, and to spoil other teams seasons, they have the Bruins in Boston, and they finish the season with back to back games against the Rangers and Islanders, in that order. Also let’s not forget, Erik Karlsson is still injured and that could play a huge factor in how Ottawa plays.